We strive to constantly improve our practices to the best, for which we have received a well-deserved prestigious international award. Below we quote the international media group – IVF Media. On 16th December 2017 we have launched the first edition of the prestigious Dental Implants AWARD 2018. The aim of the Dental Implants AWARD is to officially recognize the professional achievements of dental implant centres and manufacturers, dental surgeons and dental agencies throughout the world. The Dental Implants AWARD is given every year to innovators, pioneers and creators as well as to everyone who is doing his dental implant job extraordinarily to boost patients satisfaction and enthusiasm for implant dentistry. Such recognition is beneficial for both the clinics and the patients. Why? Dental patients more often choose clinics whose offer and pricing are transparent, services are professional and of high quality. Many dental implant clinics, dental tourism agencies and implant manufacturers have taken on the challenge and applied for the award. The Dental Implants AWARD 2018 come in 3 categories and 8 subcategories and have been awarded to 8 winners. Our jury panel has selected the winners on the basis of their achievements during the last year (2017), popularity and positive feedback from patients and innovative dental solutions applied in the treatments offered. 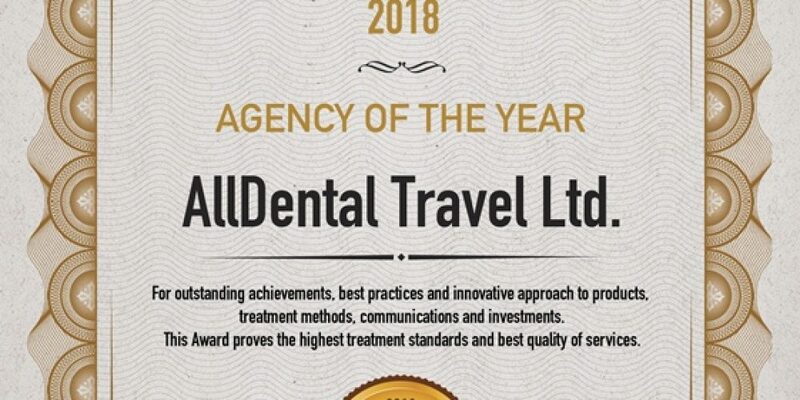 AllDental Travel is a unique Bulgarian medical tourism agency that offers assistance throughout your entire dental treatment journey. Each patient can benefit from the help of personal patient adviser and convenient remote phone/e-mail consultations. AllDentalTravel has solid several years of experience on the market of medical tourism and continues to assist international patients looking for qualitative and affordable dental care services.